Yesterday my new BR Light arrived by FedEx, just in time to give it 45 minutes on the charger before I jumped on the bike and headed north to Morgan Hill for a ride up Henry Coe with the Nightriders. I waited until dark before I started the ride back home from Morgan Hill so I could test out the new light. I had purchased the C2-H model, which is a handle bar version and the model with the higher lumen (and shorter run time). The light has three power settings, high, medium and stealth. I had them program my light so the stealth mode was at 5% instead of the normal 2% because when I tested it last Friday during the mountain bike ride, I didn’t feel the 2% would be adequate. I am glad I made that change. Before I get into how the light performed on the road, in the dark, here are some interesting comparisons between my new light and an older 20/10 watt dual light system I have used in the past. On the left is the new BR Light, which is all self contained in one unit. That means the mount, the light, the battery, the controller switch are all together. Compare that with my old light with a separate battery, a bag for the battery, cables to connect the battery to the light, a light mount, and a control switch I had to attach to the handle bar. I weighed both setups (san chargers). The BR light weighed 14.2 oz (408 grams) while my old light came in at 2 lbs, 2.5 oz (992 grams) or more than twice the weight. My old light has two lights, a 10 watt and a 20 watt, for a total of 30 watts, but with both lights I can only get a couple hours of run time, even with that heavy battery. The BR light is small enough and light enough to mount on the handlebar with no need for cords (note I have small hands). I then did a very unscientific test and shined both lights in a dark room against the wall. The BR light is on the left, the old light on the right. It should be obvious to even the most casual observer that the BR light is much brighter and the light is whiter, which is easier to use on the road. The mount for the light is attached to it. It is a clever all metal mounting system that I believe is very solid, even fully adequate for mountain biking. Once mounted, it is easy to move the light left or right as you are riding, to aim the beam. The light does not come off as quick as those lights that have a mount that stays on the bike such as my Cateye HL530, but then those mounts are often flimsy. The BR light is relatively easy to attach and remove and certainly faster and easier than setting up a light that has an external battery that you need to attach to the bike somewhere then wire it to the light on the handlebar. Now back to my ride in the dark. I rode 13 miles in the dark, part through the city streets and about 10 miles on a road that had no street lights and enough times with no cars to test things out. I found that on high power the BR light has plenty enough light for me to go as fast as I wanted. I took my speed up to 30 mph on a short descent and felt fully comfortable. On the medium setting the light is adequate for 20 mph, what I would usually do on a flat road. If the route was short enough I would still opt for the higher light setting, but the medium setting was fine, especially if the road has a white line to gauge off and is in reasonably good shape. I had a short climb where I tested out the stealth mode (my light was set at 5%). I found it adequate, but barely, for climbing at up to 7-8 mph. I am glad I had them change the setting and maybe a slightly higher setting would be useful. In any case it is about as bright in the stealth mode as my Cateye HL530, which has a claim of 1,500 candlepower (a useless measurement in my opinion). I feel that with this particular light, I could basically go all night on a single charge by using the medium setting for flats, the high power for descents and the stealth mode for climbing. The light has a 6 stage battery indicator. A colored LED goes from green (full power) to blinking green, then to orange, then blinking orange, then red, then blinking red. It is a clever system and very easy to see how much battery life left. I found using the single control button on the light to work very well. It was very responsive. If I owned a HID light I would make a direct comparison. When we did the night mountain bike ride last Friday we did an informal comparision with some HID lights on the ride and found the BR Light similar in terms of illumination. The BR light has the big advantage of using the new CRED LEDs which are very reliable and much more shock resistant than a HID light. The LED light turns on immediately and it is no problem to shut it off and back on as you wish. I have a sophisticated light meter back from the early days of photography that will measure LUX, but I have to find some batteries first. They don’t make the mercury button batteries anymore for this device that is 25 years old. When I get it to work, I can do more testing. In summary, I am very glad I bought the BR light. Earlier in the day Ann and I went on a 6 mile run before we headed to San Jose. The weather was getting warmer as we finished the run but became much warmer as the day proceeded. On the way home the car thermometer was showing 107 degrees! When we arrived home around 3:30 pm, I was glad to see that FedEx had left the package I had been expecting with the BR Light I had ordered. I quickly put it on the charger and then got ready to ride. I usually do the Henry Coe ride on Wednesday at 5:15 pm, but this time I wanted to ride it from home, even though the tempeature was hot. With only a chance for a 30 minute charge on the new light, I mounted it on the bike and took off. I made it to Eric’s house just right at 5:15, as everyone was getting ready to ride. We headed up Dunne Ave. to climb Henrey Coe. Doug was riding with us this time and he is a faster climber than I am so I knew I would have a challenge. I went ahead of everyone at the beginning and about half way up Doug decided to jump and join me. We road together until we were about to the crest before the mid climb decent and he jumped out in front and then went down faster than I can. By the time we were starting to climb again, my legs felt weak all of a sudden. I have been climbing Henry Coe with a couple of gears to spare, using a 39×21. But it seemed hard for some reason so I shifted to the 39×24 and eventually the 39×27. I thought, gee maybe I need to take my bike with the triple crankshaft on the Everest Challenge if I was having such a hard time pedaling. Could Doug have worn me out so fast? On the climb, near the top there is a short decent, then the cattle guard to cross, followed by the steepest part of the climb, sometimes we call it the wall. It is short but the grade is tough. I started to climb, using what I thought was my lowest gear, and was struggling to turn over the cranks. I looked down to see what was happening and notice I was in the BIG CHAIN RING. I guess I forgot I had shifted to it at the mid point decent and that is why it seemed so hard to pedal the last couple of miles. I had no choice but to grind it out in the big chain ring since I could not shift now. This was the short, steep pitch, that earlier I worried about when getting my new bike with a double crankshaft. Now I was climbing it in the big chain ring. I made it but it was tough. I was a bit behind Doug as we made it too the top. We decided to go back down the hill and ride up again with the other riders. I noted that we went down 1.7 miles before met up with them, almost the length of the Metcalf climb. I had checked my time for the time trail segment of the Henry Coe climb and it was 43:32, with an average HR of 158, maximum of 170, over the 6.9 mile segment. Last week Jim had mentioned that 40 minutes is considered a very good time, so I have some ways to go yet. As a comparison, Ann and I had taken 58 miles on the tandem last week. After the decent it was back to Eric’s house for some snacks. I waited until 8:15 pm, when it was getting dark before I rode the 13 miles back home because I wanted to test out my light. It worked great and I will write up in a separate entry my impression of this new light. Data for the ride ws 52.2 miles, 3 hours 37 minutes, average HR of 133, average speed of 14.5, maximum speed of 41.9 mph, total climb was 3,900 feet. From this heart rate curve, you can see I rarely went into the red zone, and then only when I was trying to climb with the big chain ring. I ride with a group called the Nightriders, who both road and mountain bike. Tonight I decided to join them for a night time mountain bike ride up Henry Coe, the largest State Park in California. I wanted to join the ride tonight because we were going to have guests from BR Lights come join us and bring some of their new lights for us to test out. I was in the market for a new light, needing something I could use for the Furnace Creek 508 in October and other events I want to do, in addition to the night mountain biking. They let me try both the handlebar light (C2.1-H model) as well as the helmet mount light (Jen-H model) with the auxilary battery pack. I got the lights setup quickly due to a clever design for both the handle bar light and the helmet light. Unlike my existing lights that required me to first put an a handlebar bracket, attach the battery, attach the light, connect the light to the battery and finally attach the control buttons to the handle bar; this unit is all self contained so the battery and control switches are all in one unit. It makes the design look a bit boxy but I was pleasantly surprised that in the field when I had mounted the unit on the bike it didn’t look as big as I thought it would after looking only at their website. The helmet light is a nice looking design, again all self contained. The only downside of this is that it is a bit heavy on the head, but not unreasonably so at only 300 grams. We took off soon after 7 pm, with plenty of light to make the first climb. Kyle and Jeni, from BR Lights, were out in the front and I struggle to keep up with them even though we were on a fire road. I realized they were great mountain bike riders in addition to knowing a lot about LED light technology. As we reached the first regroup area it was getting dark and we had a chance to finally try out the lights. After the rest of the group arrived we had a chance to compare the lights. Jim had a triple shot on his handlebar so we pointed it ahead to the right and I pointed the BR handlebar light to the left. You can see the comparison in this photo. The BR light was clearly brighter, not only over the wide area, but much brighter in the spot area. Jim also had on one of the BR helmet lights while he hammed it up for the camera. We made our way to the tricky single track. Not being a real experienced mountain biker, I normally would have been very nervous doing this single track in the dark but I found the combination of the BR handlebar light and the BR helmet mounted light illuminated up things fully. I usually was running the handlebar light on half power and relying more on the helmet light, which seemed to work fine. Both lights have a stealth mode, that sas some extremely long battery life. I tired that mode but found it too weak for anything other than maybe climbing on a road bike. Some of the riders in our group were using HID lights. I didn’t see that they were any brighter than what I was using, which is quite a feat considering the BR Lights use CRED LEDs, are all self contained with a total weight much less than the HIDs and much greater durability. It was well past 11 pm when we finished about a 20 mile ride. I was so impressed with the BR Lights that I ordered the handlebar version (C2.1-H model) right away. I would like to buy the helmet light also but that would be a bit much for me right now, but I am tempted. I hope I get my new BR light quickly before the our big night mountain bike adventure in September. Ann and I took the tandem up Henry Coe earlier today and got back home in plenty of time for me to head over to Harvey Bear for a mountain bike ride at 5:30 pm. We had a large turn out today. Including a couple of riders were just there at the same and decided to ride with us, we had 9 bikers. The hot and dry conditions, couple with some grading of the road, lead to some different conditions that the last time I was there a few weeks ago. The climb up on the road had a lot of gravel so it was tricky keeping enough traction while climbing. I was able to make it up okay, but it took a lot of energy and I didn’t have my usual reserve after being on the tandem for the climb today. The other trails were real dusty and with 9 riders there was quite a dust storm. On the tandem ride today I think I swallowed a fly and this evening I know I swallowed a lot of dirt. When I got home I was covered with dirt, especially my legs where the dust clinged to the sweat. I think we rode about 14 miles and returned just as the sun was going down. Some of the paths were in the deep shadows and with the surface conditions it was tricky. But any day on a mountain bike where I am able to keep both tires on the ground all the time is a good day. It was a real fun ride but I had enough of biking after that. I received this by email today about the upcoming Furnance Creek 508 bicycle race that I will be participating in. Participants by Country: Austria-2, Belgium-1, Brazil-1, Canada-5, Denmark-3, Finland-1, France-3, Italy-1, Mexico-1, Sweden-2, UK-2, and USA-202. Participants by US State: AZ-5, CA-151, CO-5, CT-1, FL-1, ID-1, IL-2, KS-1, MA-2, MN-1, NC-2, NV-5, NY-4, OH-3, OR-6, PA-2, SD-1, TX-3, UT-2, VT-1, WA-9, WI-3, and WY-2. 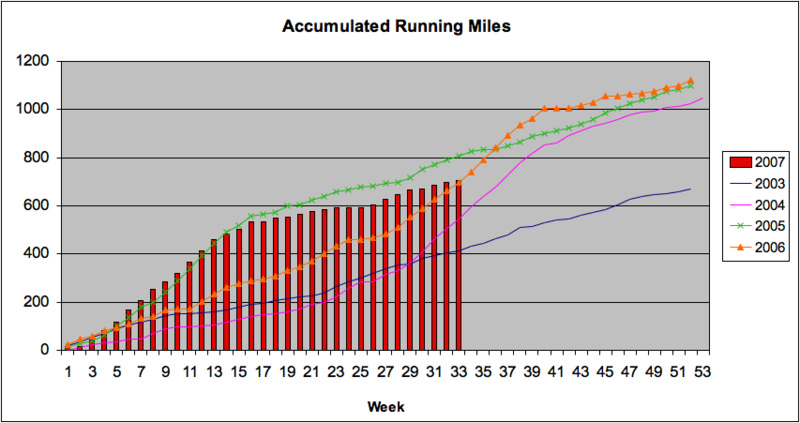 Just after I put on my blog the accumulated miles this year (both cycling and running), I was reading the September 2007 edition of Runner’s world on an article about the mileage myth. There are a lot of great resources around when it comes to training for a marathon or other long distance event, but when it comes to the equivalent in cycling the information is not as readily available. I fell that the principles are the same so I have attempted to adapt some of the information in this article in terms of cycling and preparing for an ultra distance cycling event. Rule #1. The longer the event you are training for, the higher the mileage requirement. Obviously it is going to take more weekly miles to prepare for a double century than for a century. Rule #2. Mileage requirments increase as performance goals increase. If your goal is to just finish you can cycle fewer miles than if your goal is to finish with a fast time. Rule #3. Some miles count more than others (Part One). When your miles include tough workouts (such as hill climbs, hill repeats, tempo rides, intervals) they’re harder to recover from than if you do he same easy aerobic cycling. So when you add quality workouts, decrease your total mileage slightly to make up for the added stress. Rule #4. Some miles count more than others (Part Two). The farther away your miles are from the pace you wish to do the event at, the less they will help your performance at the event. If you mostly do long miles cycling at a slow pace, you will become proficient at that but don’t expect to be able to ride the double century at a significantly faster pace. Rule #5. Allow for adaptation when increasing mileage. To avoid injury when upping your mileage you need to take it slow and allow time for your body to adapt. Rule #6. A healthy cyclist beats an injured cyclist every time. I am not speaking of injury due to falling, but injury to your muscles. I have been updating my training log using the data I download from my Polar Heart Rate monitors. I now have the data entered through August 18th. 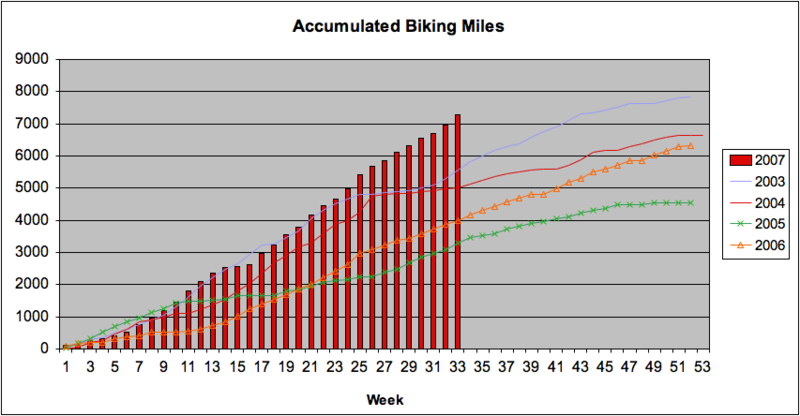 In my training log I have it plot the accumulated miles, both cycling and running, compared with prior years. From the charts you can see I am biking more this year than any prior year. 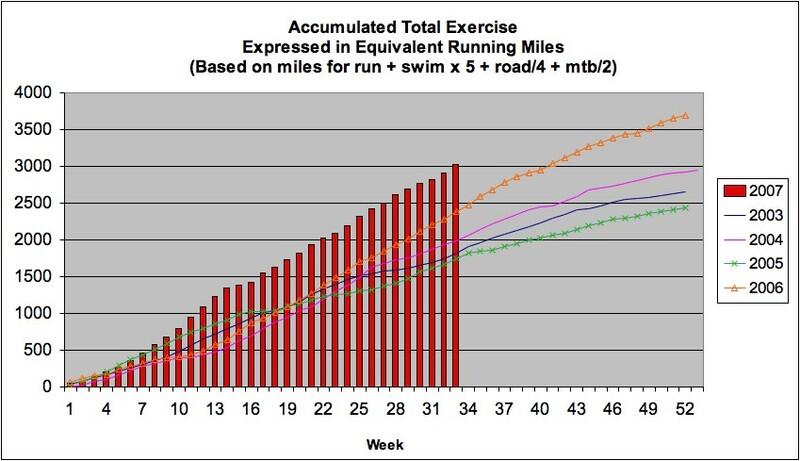 For running, the mileage is high but not as high as some prior years. Running has really tapered off since the Boston Marathon. Cycling is clearly becoming my dominant sport now. Joe lead the club ride today for Furnance Creek 508 training. Myself and Gary showed up. I think the warning in the ride description about the need for strong wheels, and winds, scared some people away. Joe’s wife, Rosa, was there to drive their SUV vehicle as a SAG. We would need that because there was only one place to get water. It turned out to be a 128 mile ride and very difficult. I had been out on these roads before but never tried to do it at the the speed we rode today. For some reason my legs felt like lead from the very beginning. It was a long, hot and hard day riding. I brought back some Mavic wheels from Utah because they are strong (and on the heavy side). I put them on my older Trek bike and installed the aerobars, all on Friday night, after driving all the way home that day from Utah. I am thinking to take my older bike for the FC 508 so I wanted to test it out. 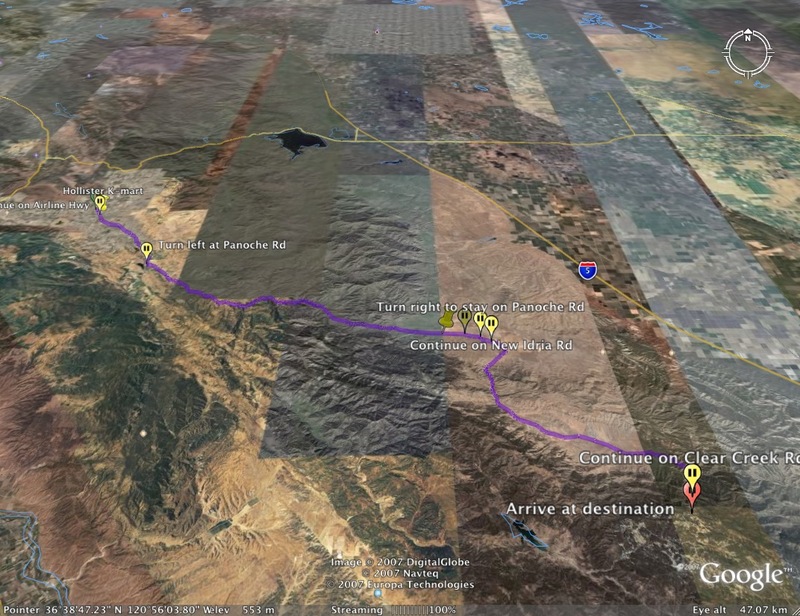 We started the ride in Hollister and biked first on Southside over to Tres Pinos, then highway 25 to Paicines, then turning left on the Panoche road. We did not stop until we hit the Panoche Inn where we got some water because Rosa had not yet caught up with us. We then headed further on toward New Idria. The road gets very rough out past that spot, with twisting turns and up and down. I tried to use my aerobars at times but it was almost impossible because it was so bumpy. There was some forest fire out there because we were being passed by many big fire trucks, from CDF. When we were almost to New Idria, we were stopped and could not visit the ghost town, I guess because of the fire. We decided to eat our lunch which we had loaded in the car with Rosa. The image below shows the route we took (click to enlarge). ￼ There The way back found the headwinds we expected. I felt wasted and didn’t attempt to keep up with Joe and Gary. I saw that they were drafting behind Rosa in the car so I knew that I would fall even further behind. About 6 miles from reaching the Panoche Inn, Rosa dropped back and pulled me in. Drafting behind a SUV, especially with the headwinds makes a hugh difference. Back at the Inn I drank a couple of cokes and ate some more bars and filled up my water bottles.. Then it was the ride back to the start. Again I fell behind the othr riders and again Rosa dropped back later to pick me up. She said Joe was only 0.3 miles ahead so I drafted behind her until we caught Joe. The two of us drafted for awhile but then Joe dropped off, I guess because of the pace. It also took a lot of effort to draft behind the vehicle because you have to ride your brakes and pay close attention. I used the draft most all he way back to Highway 25, but we never to catch Gary. I then biked on my own and finally caught Gary, who had stopped at Tres Pinos. In went in the store there and bought a pint of chocolate milk. I could not seem to drink enough. I drank that right down and then Gary and I jumped on our bikes and went the final 8 miles back to to Hollister. It was now 5:20 pm, rather later for the miles we did, but it was a hard ride. I found this information about the New Idria town on the website. A part of a mercury extraction plant of the New Idria Quicksilver Mining Company. The New Idria Mining Company was formed soon after the discovery of cinnabar (quicksilver ore) in southern Diablo Range of central California in 1854. The town of New Idria began around 1857 and about 300 men were employed at the mine by 1861. The first school opened in 1867 and the New Idria Post Office opened in 1867. In 1894, the New Idria Post Office dropped the word “New” and the town become known as Idria. The New Idria Quicksilver Mining Company closed 1974 and the town has since become a ghost town. New Idria is a California Historical Landmark (#324) and home of the world’s first Gould Rotary Furnace. The Gould Rotary Furnace revolutionized ore processing technology worldwide. The New Idria area is known for its abundance of rare minerals such as Benitoite, named after San Benito County. Gem quality Benitoite is only found in this area of the world.